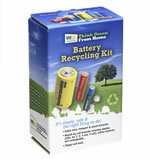 Each Dry Cell Battery Recycling Kit can hold about 4 lb of batteries and comes with a pre-paid return shipping label. The positive pole of each battery must be taped. Do not place lithium batteries in the box. When the box is full, seal it and place it in your mailbox. Sign up for "My Green Activity" and we will email you a Certificate of Recycling that confirms your batteries were responsibly recycled. 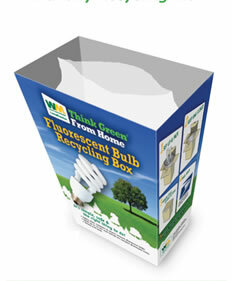 Each CFL Recycling Kit can hold up to 13 13-watt CFLs and comes with a pre-paid return shipping label. 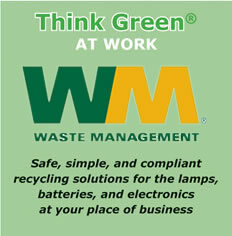 The re-sealable VaporLok bag allows you to safely collect spent CFLs. When the box is full, seal it and place it in your mailbox. Sign up for "My Green Activity" and we will email you a Certificate of Recycling that confirms your bulbs were responsibly recycled. Each MedWaste Tracker Safe Solutions for Sharps contains all of the components necessary to dispose of one-hundred-forty pen needles or seventy-five 1cc syringes. Each Household Straight Tube Recycling Kit holds 16 t-8 or 7 t-12 four-foot lamps and comes with a pre-paid return shipping label. (Not for use with lamps longer than 4 feet). The re-sealable VaporLok bag allows you to safely collect spent tubes. When the box is full, seal it and return via UPS. Sign up for "My Green Activity" and we will email you a certificate of Recycling that confirms your tubes were responsibly recycled. Send mail to webmaster@wmlamptracker.com with questions or comments about this web site. Copyright © 2018 Waste Management, Inc. & Brimark Consulting Group. All rights reserved. Information in this document is subject to change without notice. Other products and companies referred to herein are trademarks or registered trademarks of their respective companies or mark holders.